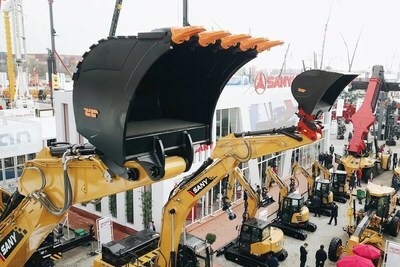 CHANGSHA, China, April 17, 2019 /PRNewswire/ — SANY Heavy Industry (hereinafter referred to as SANY) released the annual report of 2018, saying that the enterprise achieved annual sales revenue of 55.822 billion yuan (8.329 billion USD), year-on-year growth of 45.61 per cent; the net profit attributable to shareholders of the listed company reached 913 million USD, year-on-year growth of 192.33 per cent. SANY Heavy Industry has got remarkable achievements in 2018, hitting the best record in its history. According to the annual report, SANY excavator reached sales revenue of 2.87 billion USD, year-on-year growth of 40.8%, which has been the top seller in the domestic market for 8 years. Due to SANY’s leading R&D capacity, its excavators have world-class quality and competitiveness in the global market. Concrete machinery reached sales revenue of 2.53 billion USD, year-on-year growth of 34.64 per cent, ranking No.1 brand around the world; hoisting machinery reached sales revenue of 1.39 billion USD, year-on-year growth of 78.26 per cent with market position promoted significantly; piling machinery reached sales revenue of 698 million USD, year-on-year growth of 61 per cent, ranking No.1 brand in China for its continuously rising market share. SANY’s overseas sales revenue reached 2.03 billion USD, year-on-year growth of 17.29 per cent. The rapid growth was contributed by SANY’s 8 overseas sales regions including southeast Asia, Indonesia and Latin America as well as overseas industrial parks such as SANY India, SANY Europe and SANY America. It’s worth mentioning that the sales of excavators had rapid growth in the overseas market with market share remarkably increased in the past year. SANY’s digital and intelligent transformation had fruitful achievements in 2018. The corporation fully pushed forward digitalization and intelligent upgrading in marketing, R&D, supply chain, finance and service, carrying out a series of digital projects such as PLM, CRM, SCM and GSP in order to make manufacturing equipment interconnect with sales facilities. As of 2018, SANY had applied for 8,107 patents and authorized 6,657 patents, ranking No.1 in the domestic industry. In 2018, SANY rolled out a number of new products including H series excavators SY155H, SY225H, SY305H, SY395H, the first wheeled hydraulic excavator SY155 and all-terrain crane SAC2200T. SANY enhanced the research and development on intelligent, unmanned and environment-friendly products including intelligent excavators, unmanned rollers, unmanned off-road crane SRC600C and remote controlled all-terrain crane SAC1100S. In 2018, Liang Wengeng, chairman of SANY Heavy Industry, was awarded “The top 100 outstanding private entrepreneurs in the past 40 years of reform and opening-up” and was listed as “The 50 most influential business leaders in China in 2018” by Fortune Magazine. SANY also won the honors of “the most admired Chinese companies in 2018”, “the top 500 enterprises of China”, “the most influential innovative companies” and “the Chinese brand achievement award in the past 40 years of reform and opening up”. What’s more, SANY has been the most prestigious brand of Chinese construction machinery users for 10 years. SANY SY395H excavator won the top prize “Golden finger award” of “the top 50 annual products in 2018 of Chinese construction machinery”; SANY SR285R-C10 rotary drilling rig won the gold award of market performance for its overwhelming domestic market share.